Our next Boomerang Bag session is scheduled for Monday 11th March at 6.45pm. Be an active contributor to the war on waste and the eradication of the plastic bag. Come to a boomerang bag workshop at Iris & Dora to help with making Boomerang Bags. All are welcome to join our little community of Boomerang Bag Sewers. No skills necessary, just bring yourself. 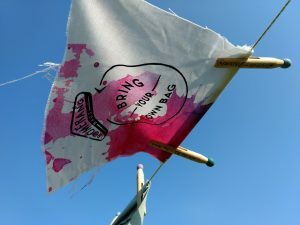 “BOOMERANG BAGS IS A GRASSROOTS, COMMUNITY DRIVEN MOVEMENT TACKLING PLASTIC POLLUTION AT ITS SOURCE. The bags are given away to friends, family, colleagues, bagless strangers and so on, as a plastic bag alternative that can be used and reused, or passed on to others in need.